Breathe new life into your sandal collection with this flip flop. Soft leather straps sit lightly on feet while thick layers of foam provide cushioning and support. Set apart by a sleek, sculpted wedge in a supremely wearable height, the Mattie maintains its signature versatility and unparalleled comfort – perfect as everyday staples or travel companions. This slide has triple straps at the vamp and upper, connected with braid detail. It features a mini stacked leather wrapped midsole, a plush Poron® foam cushioned insole with leather lined footbed and added arch support, and a sculpted wrapped wedge with 1″ platform and a molded rubber outsole. A Chelsea-inspired boot with a moc-stitched toe is shaped from rich suede and lined with plush UGGpure™, a textile made entirely from wool but shaped to feel and wear like genuine shearling. An EVA sole adds lightweight comfort. Box stitching along the heel of this boot smartly updates this Classic Mini, which features waterproof leather and water-resistant construction. Rain or shine, this boot provides signature UGG® comfort with natural wool linings and a lightweight and flexible molded EVA outsole. This special Navie has a shiny golden color in this new appearance! The UGG Navie is an easy slip-on style flip flop with a soft leather lining and a perf cushioned footbed for additional breathability. 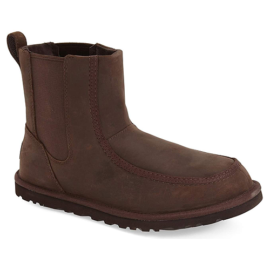 Custom designed Treadlite by UGG with RMAT technology outsole, EVA, or rubber with patent-protected UGG logo tread. A wedge so comfortable you’ll think you’re wearing flats. The strappy silhouette is made from smooth leather with braided details for luxe texture. Brighten up rainy days with this glossy rubber boot. For the traditional girl who loves the classic plaid print and isn’t afraid to show it! Its traditional plaid print is sure to bring a smile to your face. Glossy rubber upper is waterproof constructed. Easy pull-on design. 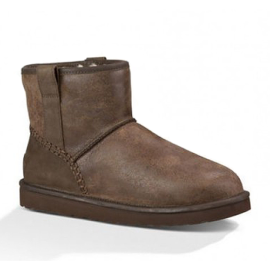 The Shaye contains luxurious UGGpure™ wool lining and insole that will pamper your puddle-jumpers. Minimalists will love the clean lines and rich, supple leather of this backless slip-on. A luxurious natural wool insole lends a plush finish. To keep feet cushioned, this flat features the Imprint by UGG™ insole, which includes three layers of foam and a soothing sheepskin heel lining to prevent blisters. Freshen up your wardrobe with the Hydra slip-on sneaker. This sporty sneaker is designed with innovative Orthaheel® Technology that provides superior orthotic support, relief and stability to help ensure natural foot alignment. Daring details demand attention on the Upright Sterling. A sassy side-zip and asymmetrical topline give this ankle bootie a confidence-boosting edge.